Board of Governors act as a ‘critical friend’, helping to support the Headteacher and the leadership team at all times whilst providing appropriate challenge on any matters affecting college life. The Governors’ first line of accountability is to parents and the wider school and local community. According to the law, the purpose of a Governing Body is to ‘conduct the school with a view to promoting high standards of educational achievement at the school’. Our responsibilities are described in more detail in The School Governance (Roles, Procedures and Allowances) (England) Regulations 2013. See also The Governance Handbook for Trustees of Academies and Multi-Academy Trusts and Governors of Maintained Schools, published by the Department for Education, November 2015, and The Constitution of Governing Bodies of Maintained Schools, published by the Department for Education, August 2015. All governors sit on the Full Governing Body (FGB). The Clerk is a paid role appointed externally by the FGB. All governors, with the exception of the Chair and Vice-Chair, are asked to sit on two committees which reflect their skills, experience or interests in education. The Chair and Vice-Chair cover all the committees between them. Pay Appeals and Disciplinary Panels. The Board of Governors makes all executive decisions for the College that cannot be delegated to the Headteacher or a Governor Committee. The key functions covered by governance are: budgets, staffing and performance management, curriculum, target setting, admissions, discipline and exclusions, health and safety, religious education and collective worship, premises and insurance, school organisation and identity, information for parents, and Board of Governors procedures. Decisions concerning delegation are reviewed by the Board on an annual basis; in particular the Board agrees overall strategy and vision for the College and tracks performance against development and improvement plans. The Board meets six times per year (twice per academic term) typically at 5.30 pm on Monday evenings. This Committee is responsible for advising the Board of Governors on all aspects of College financial arrangements including the Schools Financial Value Standard (SFVS), budget setting and tracking, resource concerns including capital and site issues, and the financial considerations associated with the College Improvement Plan (CIP) and audit reviews. The Committee is also responsible for advising the Board of Governors on human resources issues, processes and policies, including monitoring and reviewing the impact of all policies which affect College staff such as equal opportunities, codes of conduct, staff sickness and absences, grievance policy and guidance, staff training and development, continuing professional development, etc. The Committee also undertakes an annual survey of all staff (teaching, support and senior leadership team) as part of an ongoing consideration of staff wellbeing and reports the results to the full Board of Governors. Resources Committee meets five times per year or as required. This Committee is concerned with curriculum, standards, improvements, pupil welfare, safety and wellbeing. The Committee is responsible for advising the Board of Governors on all aspects of curriculum arrangements. This includes the monitoring of teaching and learning, attainment and progress towards targets. The Committee supports the Headteacher and staff on related issues, with special reference to the curriculum considerations within the College Improvement Plan (CIP) and audit reviews. The Committee reviews the performance of pupil cohorts through the study of available data including school data, RAISE online and Fischer Family Trust. It reviews and monitors subjects in line with the College Improvement Plan. It oversees the work of the subject Link Governors. It reviews Special Educational Needs and Disabilities (SEND), its intervention provision and impact. The Committee monitors progress and outcomes for disadvantaged groups, Pupil Premium and Able Children. It reviews attendance, absence and exclusions data. The Committee monitors and advises the Board of Governors on the overall welfare, safety and wellbeing of the pupils, safeguarding and equal opportunities for pupils, the Prevent strategy, and the development of the Single Equality Scheme. In addition the Committee monitors the support provided for individual pupils and vulnerable groups, monitors attendance, and encourages cross-curricular integration for enhanced pupil learning. The Standards and Wellbeing Committee meets four times a year (at least once a term) and as required. This Committee is concerned with achieving the aims of the whole College pay policy in a fair, transparent and equal manner and applies the criteria set by the whole College pay policy in determining the pay of each member of staff at the annual review. The Committee works with the Headteacher in ensuring that the Board of Governors complies with the Performance Management Regulations, including capability procedures, and reviews the Headteacher’s recommendations on the pay of teaching staff and reports back to the Full Board of Governors. Pay Committee recommends to the Board of Governors the annual budget required for pay. The Committee receives recommendations and advice from the Headteacher’s Performance Management Panel on the pay progression of the Headteacher and informs the Board of Governors on the pay progression of the Headteacher. The Committee meets twice a year or when required. This Committee oversees the management of the community recreation facilities which were jointly developed by the College in partnership with Winchester City Council, the Hampshire County Council and the parish councils. Although many parts of the College are now used regularly by community groups for a wide variety of purposes, the Community Committee is specifically charged with overseeing all aspects of the management of the sport facilities such as the sports hall, gym, multi-use games area and indoor facilities. 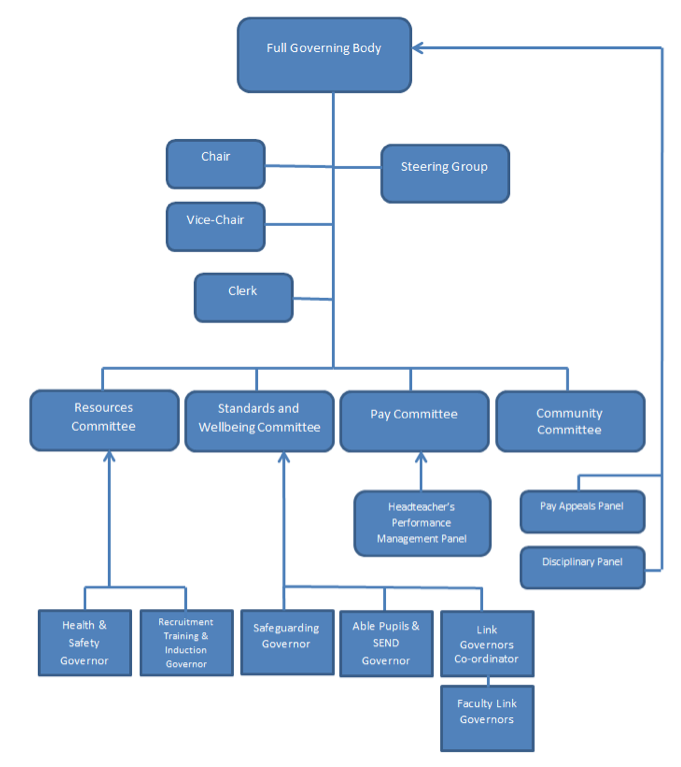 The Committee works to programme community use of the facilities within the agreed available hours; developing and scrutinising usage policy, including conditions of use set by the Board of Governors; proposing an annual budget for approval by the Board which covers costs arising from the operation and maintenance of the facilities and staffing; scrutinising hire charges and fees for community users and putting these forward for consideration as part of the budget approval process by the Board of Governors. In addition the Committee co-ordinates a sports development plan, in partnership with local strategic bodies, clubs and community groups; and ensures that appropriate health, safety, licensing, welfare and equalities standards are met for community users. This Group is made up of the Chair and Vice-Chair of the Board of Governors, Committee Chairs, Headteacher and Clerk to the Governors. This group meets at the beginning of each term to agree the agendas for the Board of Governors meeting and Committees and to ensure all essential business items are dealt with in a timely and efficient manner. Monitors and audits children and child protection at the College. Governing Bodies have a statutory responsibility to monitor and audit child protection and safeguarding and there must by law be at least one Governor trained and accredited in child protection and safeguarding. Monitors, reviews and audits health and safety policies and procedures. This is a statutory requirement. This Governor monitors and reviews the provisions, processes and outcomes for able pupils, those pupils with special education needs, disadvantaged pupils and pupils with disabilities. This is a statutory requirement. In support of the Standards and Wellbeing Committee, all subjects within the College are allocated a Link Governor. Link Governors visit their linked department or faculty at least once during the academic year, and discuss progress and any issues arising, with particular reference to the College Improvement Plan and strategic targets. Link Governors report to both the Standards and Wellbeing Committee and the Headteacher. The Recruitment, Training and Induction Governor ensures that experienced and committed people are recruited to the Governors, and once recruited they are trained and properly inducted. Disciplinary Panel, which is convened to hear any appeals pertaining to exclusions. There is a set statutory procedure and the Local Authority (LA) also has involvement if ever such a panel is required. In addition Governor Hearings may be established concerning other disciplinary matters. Pay Appeals Panel, this panel is convened as required and reports directly to the Board of Governors. There is a set procedure.